Currently Donna and I are back in SF, with our respective South America and Shanghai journeys completed. We spent this past weekend staying at the Hayes Mansion in San Jose attending the traditional Indian wedding of Donna’s friend Jessica to her now-husband Ganesh. It was fantastic! 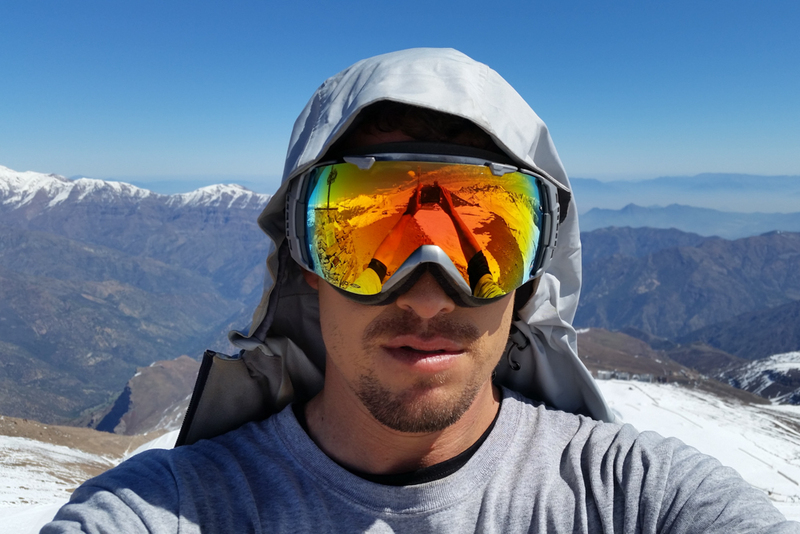 I owe everyone a post about my last week and a half in Chile, which I spent searching for good surfing and snowboarding. I was fortunate to find both! 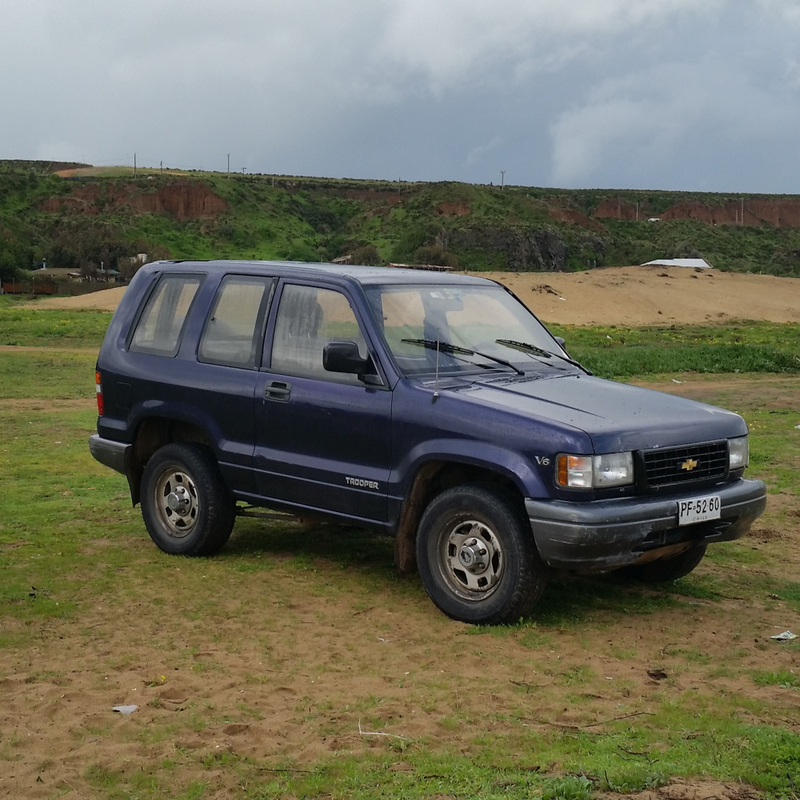 Immediately upon renting the “Chevrolet” Trooper* I contacted a friend-of-a-friend who lives in Santiago with his wife and 2 young children. 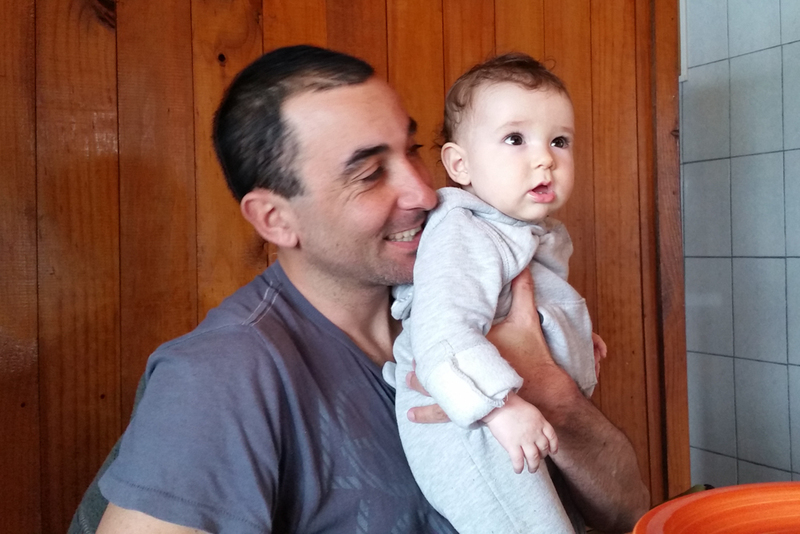 Sebastian used to live in San Francisco and while in SF he met my good friend Haroldo, with whom I used to work with at Blackrock, while the two of them were surfing at Sloat Street at Ocean Beach. When Haroldo found out I was heading to Chile, he graciously offered to put me in touch with Sebastian, who is an avid surfer and snowboarder, but who also works in Chile as a Financial Advisor, which meant we had a bit more in common than just being “surf bros”. One thing I learned early about travelling is that a local connection can be a huge boon for getting dialed into the information one needs to know to find success adventuring in a new location or country. Therefore I took Haroldo up on his offer and got in touch with Sebastian and, as expected, he proved immensely helpful and more importantly I made new lifelong friends with him and his family! * Car people might know that Isuzu makes the Trooper, not Chevrolet, but for some reason the vehicle I rented for the low price of $23 per day had Chevrolet branding all over it. This was a first clue there was something funky and untrustworthy about this car, but at this point in time I was mostly stoked to have some wheels! Upon calling Sebastian on a Saturday and letting him know I’d like to meet up with him, he suggested that the following day I drive to meet him at a town about 2 hours north of Renaca called Pichiquy, where he was staying for the weekend with his family to surf. Without hesitation I got up early the next day and headed to Pichiquy. By Sunday the beautiful, sunny weather I’d experienced in Renaca for the past two days became gloomy and the weather forecast called for on-and-off precipitation over the next week and higher than normal winds. 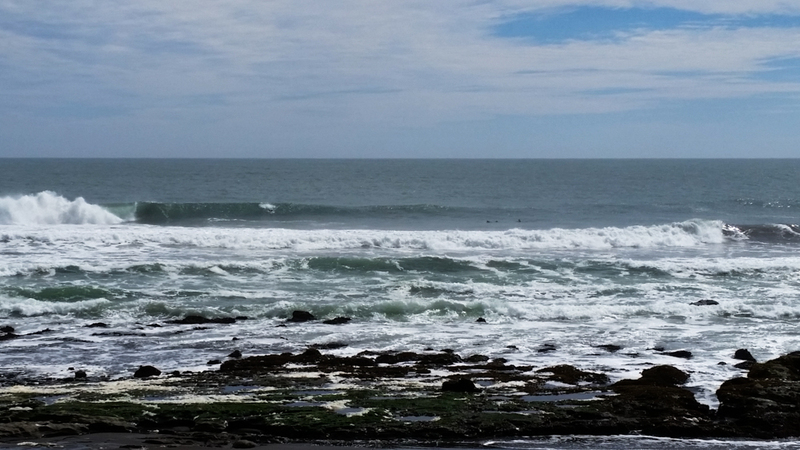 Fortunately there was still plenty of swell on tap (there’s hardly ever a shortage of swell in Chile! 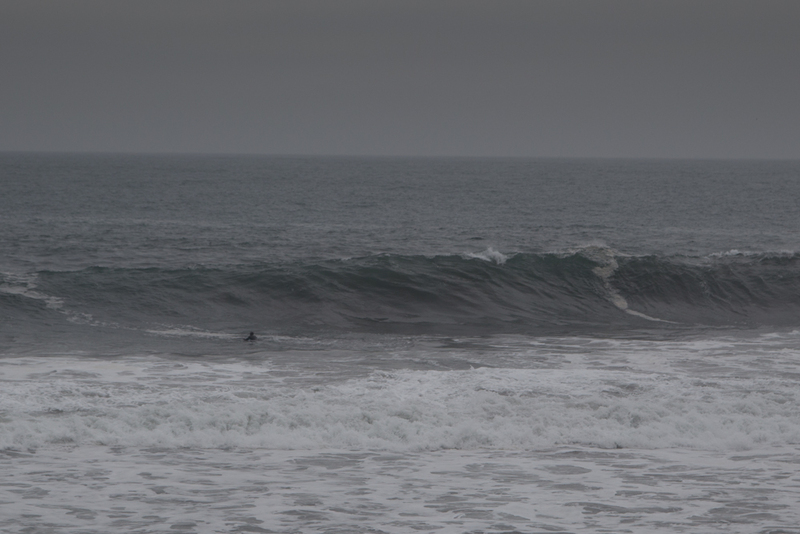 ), which meant finding good waves would require being in the the right locations given stormy conditions. On the coastal drive north that Sunday morning I passed many beaches and rounded many headlands, but didn’t see any appetizing surf and saw no surfers anywhere in the water. 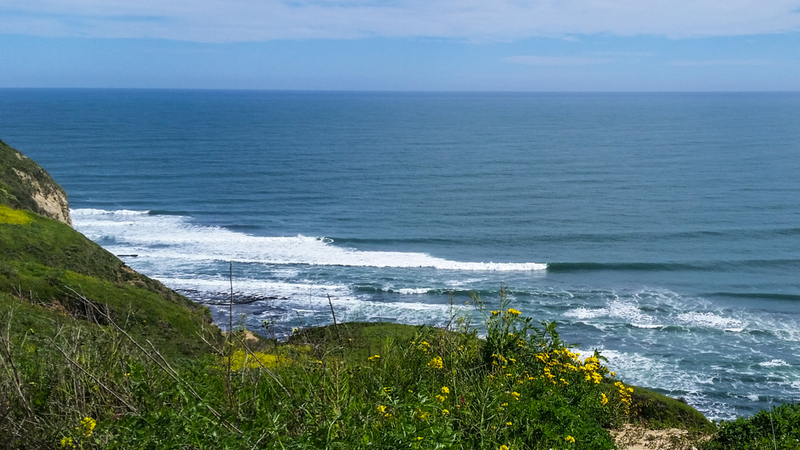 However, as I came down the hill towards Pichiquy, I saw a sea that was smoother and lightly groomed by offshore winds with a small pack of surfers enjoying some excellent looking beachbreak. I watched the surfers for awhile and then met up with Sebastian at the house he was staying at. 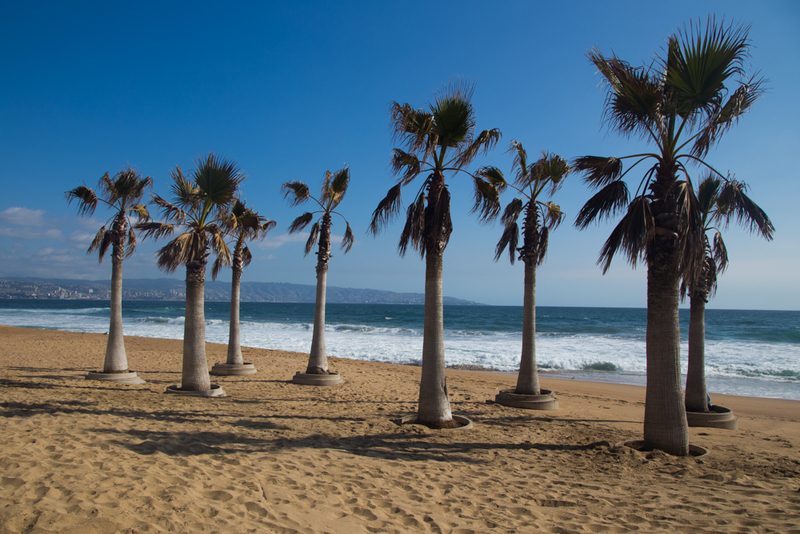 He explained to me that in Chile the incoming weather caused north winds and that north winds generally wreck most of the good surf breaks in Chile, especially the copious left points south of Santiago. However, he told me that this particular location, Pichiquy, is a swell magnet and that north winds are good for the waves, which is why he was spending the weekend here with his family. Local knowledge at its best! 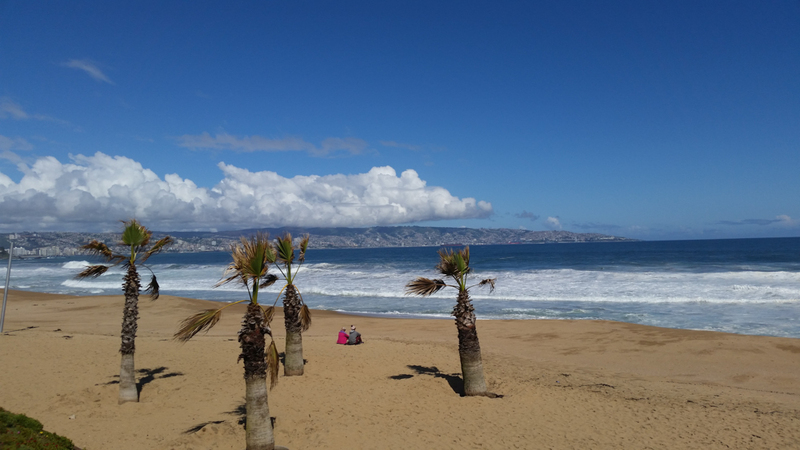 Pichiquy also is home to two big waves: La Marmola breaks in the middle of the long beach and Punta Docas is at the north end. The area that was good while I was there was the break in the middle of the beach, just north of a few exposed rocks. That morning I ate a light breakfast with Sebastian and met his family. His wife, Magdalena, speaks great English, is also loves to surf and snowboard. The two of them had two young sons, aged 2 and 7 months, named Andres and Beltran. 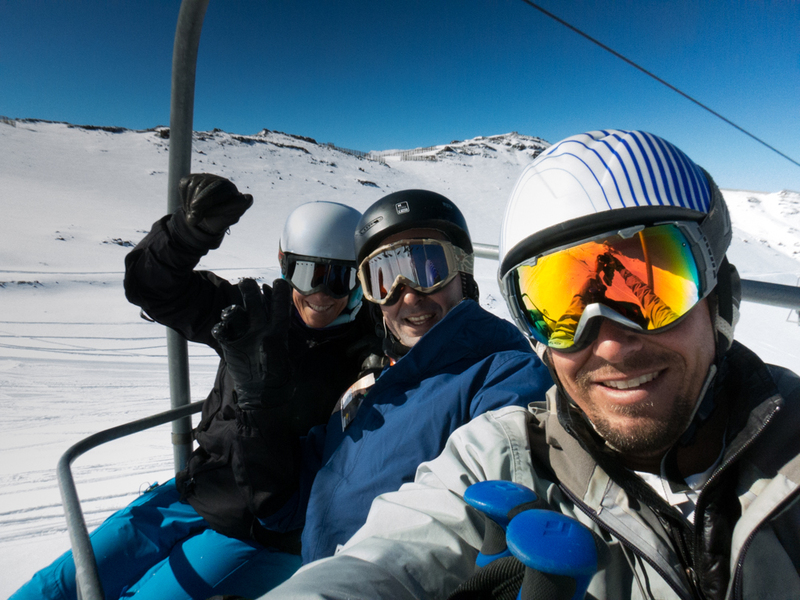 During typical weekend they would head either to the mountains or the beach with the family to enjoy board sports and the Chilean countryside. That day I surfed 2 sessions, the first with Magdalena and Sebastian’s brother, and the second with Sebastian. Afterward we ate a spaghetti meal together and Sebastian gave me a 6’6” rounded pin surfboard to use for my time in Chile! I was super stoked to get the board because I didn’t have one and there didn’t seem to be any easy place to rent a good board. Further, buying a good board would cost at least a couple hundred bucks and would be difficult to sell when it was time to go and impractical and expensive to bring back with me as airlines generally charge at least $150 each way for travelling with a surfboard. Thanks Sebastian! 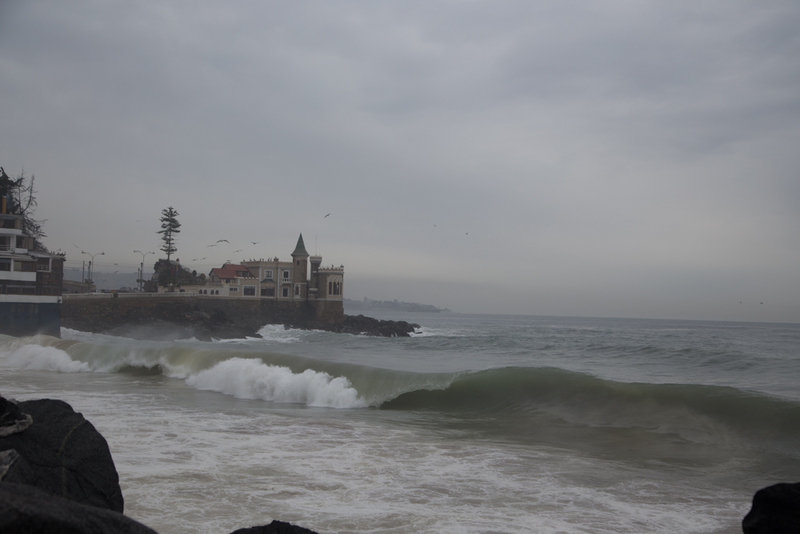 The next day was Monday so Sebastian was back in Santiago for work, but I drove back to Pichiquy and surfed all day. I got up early, packed a bunch of food and drove out, waiting to surf my sessions in between when the few packs of locals would paddle out. It was off-and-on again raining and putting on that wet wetsuit over and over again was most unpleasant, but the waves were good and plentiful. 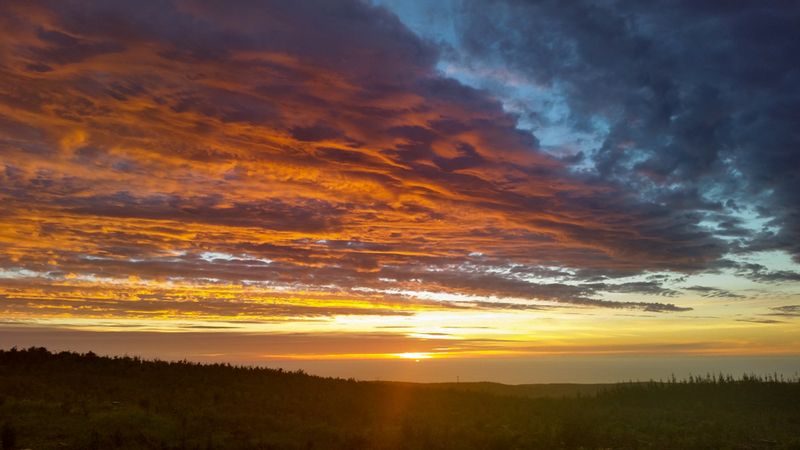 At the end of the day the clouds parted and I was treated to a brilliant sunset. 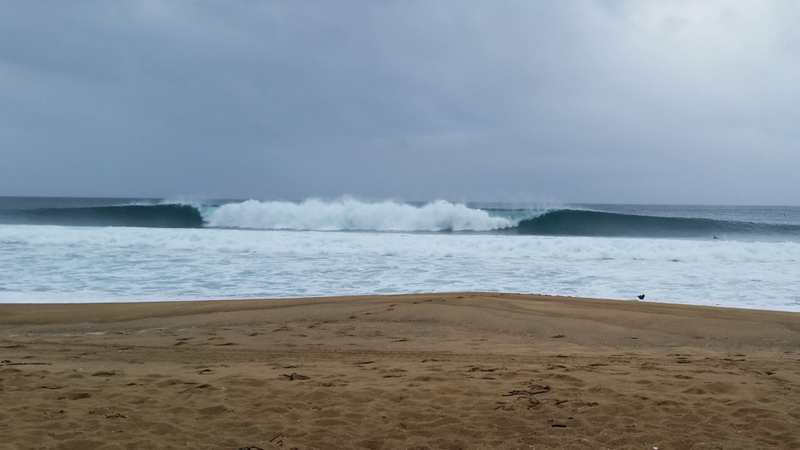 Good barrels were out there! On Tuesday the swell picked up a bit and I was pretty tired from the previous two days of being in the water for 5+ hours each day, so I slept in and decided to explore closer to Renaca. I discovered a good plan for learning about where to surf when in a new place is to go to the local surf shop and hang out and I figured it would also be a fun place to practice some Spanish. Right in front of the beachbreak at Renaca there is a surf shop and the owner and his friend were cool and they took me along with them to check the wave called Cap Ducal at the estero of the Vina del Mar river. The wave looked like it had potential and there was even one guy surfing but they call this river “crap river” for a reason and things only seemed presently much worse due to the recent rain. There was no way I was going to surf this wave because the water was greenish brown and I could smell the poo 50 feet away from the water. I really couldn’t believe that one surfer, who was pretty good, would risk hepatitis surfing it. The two locals from the surf shop didn’t want to surf it either and they took off to do a gym workout instead and said I might find waves somewhere to the north of Renaca. I saw a few people surfing at a few spots in the Con Con area, but none of the waves looked very good and I ended up just driving around and taking photos. 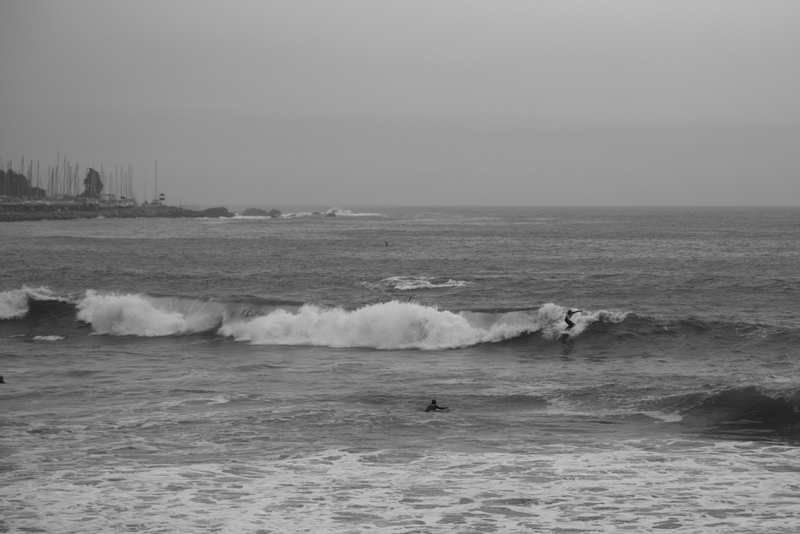 The locals were out surfing this wave in Con Con, not good but a place to get some bumpy rides. 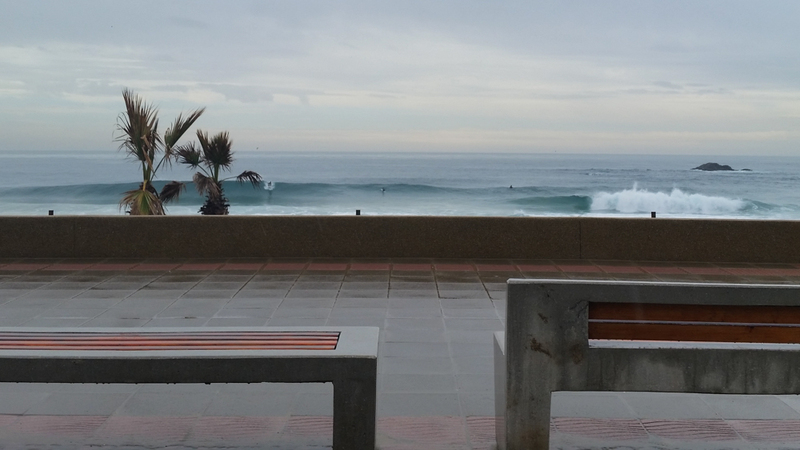 Wednesday the swell dropped and Renaca started to look pretty good. I surfed two sessions one in the morning and one in the evening. The craziest part about when I surfed Renaca were the overly friendly, borderline hostile sea lions. There was a huge colony and they did not seem at all concerned with surfers as they swam all around me, getting very close and a few times even touching my board or booties. It was actually pretty creepy — if one of these guys bit it would hurt like hell and give me who-knows-what diseases! As far as the surf went, for most of my stay the wave was not really that good, most rides consisting of a quick, steep drop where you’d hope for a section to hit or if you were really lucky maybe a short barrel. But I caught a lot of waves and had fun and I can see the potential for epic waves at Renaca under the right swell and sandbar conditions. 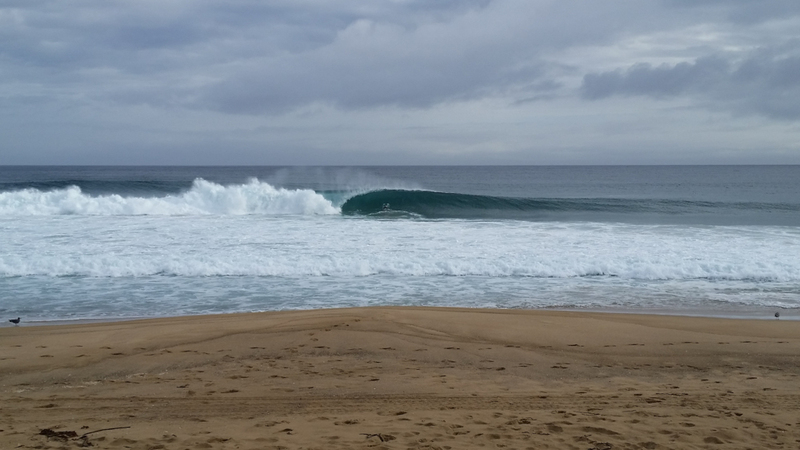 Best waves I saw at Renaca were mid afternoon on Wednesday. 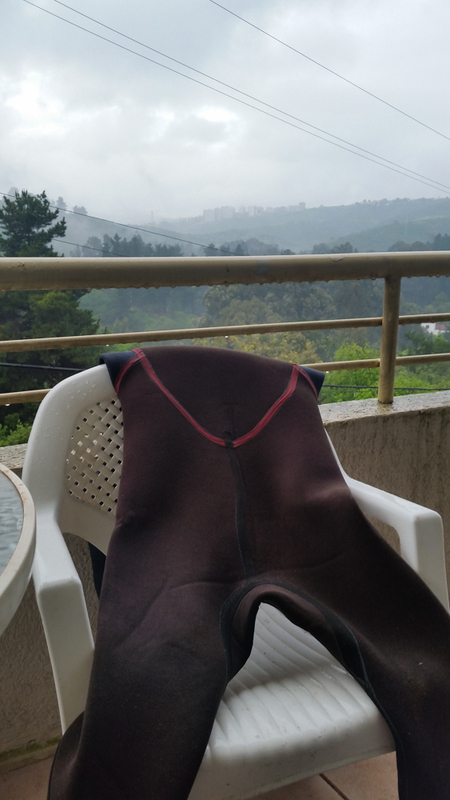 The weather was rainy and there was no good place to dry my wetsuit; I ended up putting on a cold, wet wetsuit before every session, so miserable! Wednesday night was the 3-year anniversary party at Delirio and I had a lot of fun with Matti and Berner, but staying up late was not conducive to an early rise the next day. Matti, Berner and I ended up not even leaving the house until after 3pm. 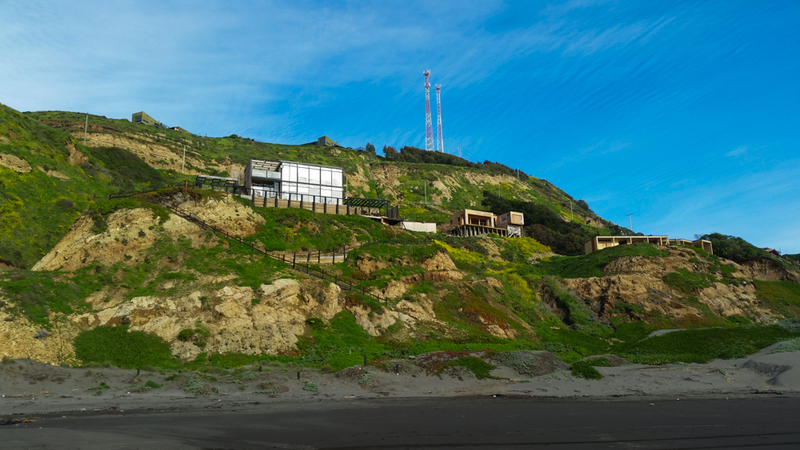 This was the day were drove down to Quintay and later had a nice Thai dinner in Valparaiso, which I wrote about in my previous post. On Friday I put into effect my plan for a Chilean roadtrip. My rough idea was to spend the next 10 days or so chasing surf and snow in the region of Chile that starts just below Santiago and extends another 300 miles to the south to Picon. After the downpour over the previous few days the weateher was forecast to revert back to the normal pattern for at least a few days, meaning generally south winds and clear skies. 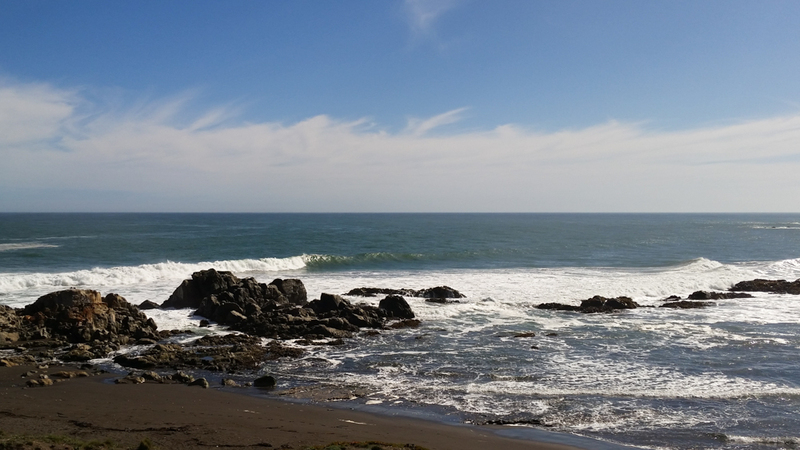 The wave forecast called for a few medium sized pulses of swell, so I decided my first destination would be Pichilemu, the surf capital of Chile. 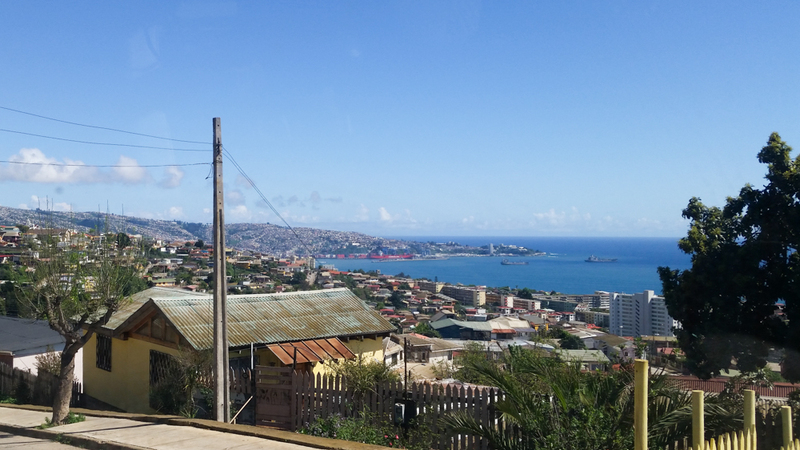 I was on the road from Renaca by about noon and drove south, purposely taking a more coastal route rather than jetting south via the main highway. Google had me taking some seriously back roads, some of which weren’t even paved, and there were points where I certainly would have gotten lost if it weren’t for real-time GPS on my Samsung S5 phone overlaid on the cached map, which would quickly reveal if I made a wrong turn. 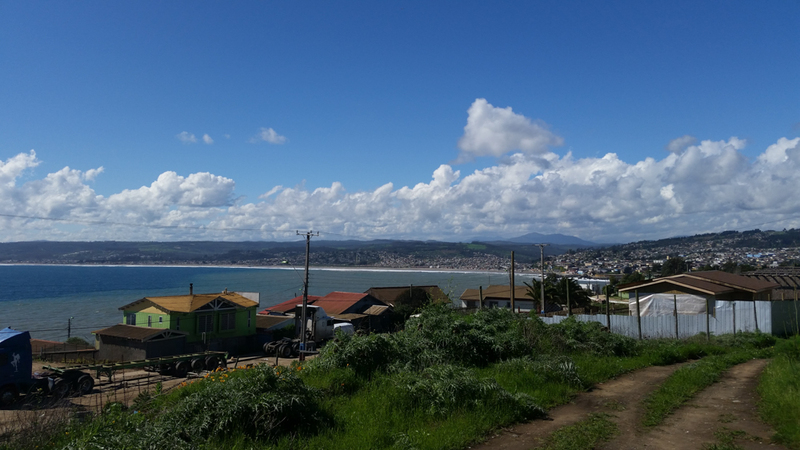 I wound my way through a few coastal towns, the largest of which is called San Antonio and made it to Pichilemu by about 6pm. 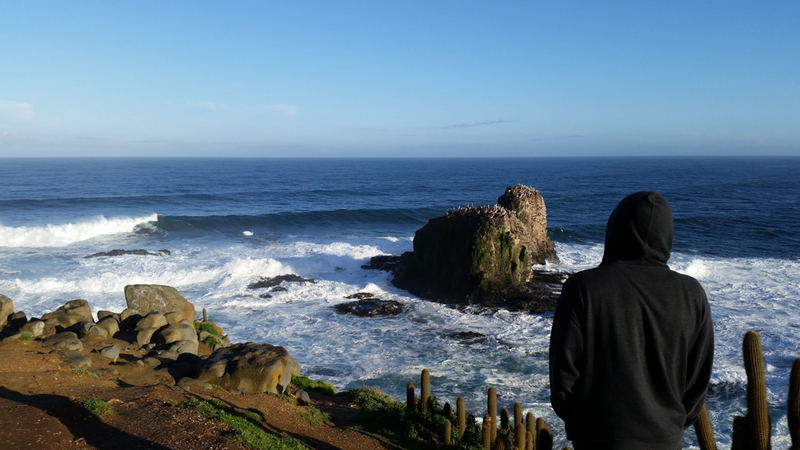 I had time to search for the ideal place to stay and found a hostel called La Sirena Insolente that was very close to Pichilemu’s headline surf point: Punta Lobos. At the hostel I met Nick, a young surfer and computer programmer who had been traveling through Chile and South America for the last few months. He’d been staying at this hostel and surfing for several weeks and seemed to have the place well understood. There were also a bunch of other young foreign travelers from Santiago staying at the hostel just for the weekend and we all went to dinner at a nice, cliffside restaurant. Staying at a hostel for the first time in awhile reminded me of how easy it is to meet other travelers at hostels. 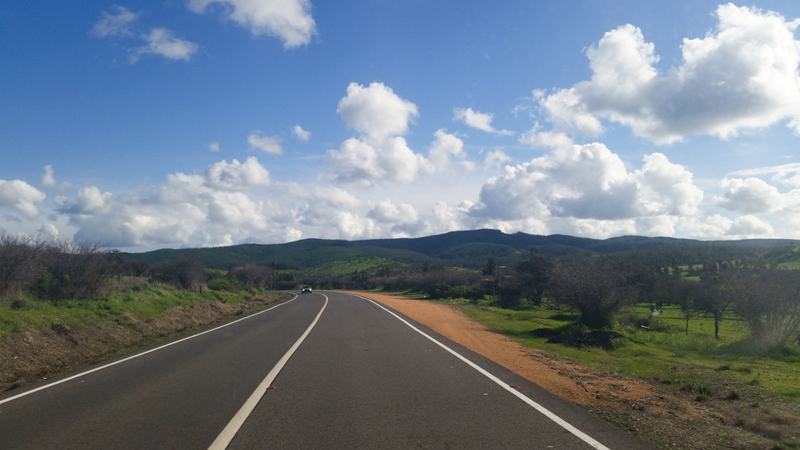 After a week of rain and clouds, there was nice weather on Friday when I left Renaca. 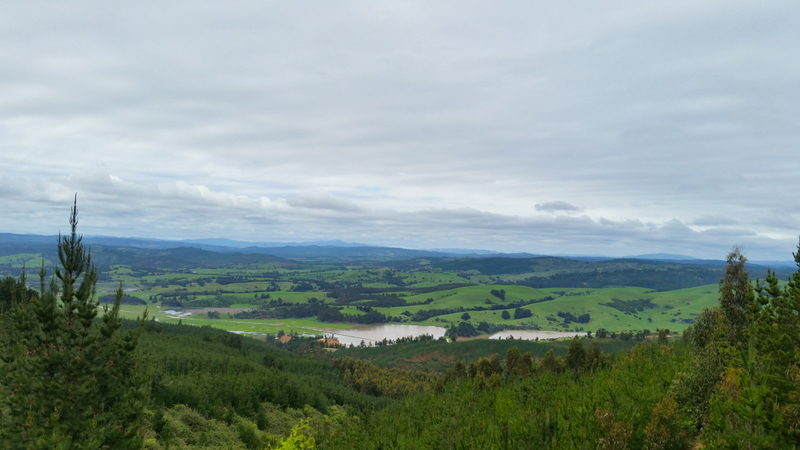 Chile can be beautiful and green in the winter. This is a shot from the car during my drive. Me plus the random hostelers. Nick is the guy closest to me. 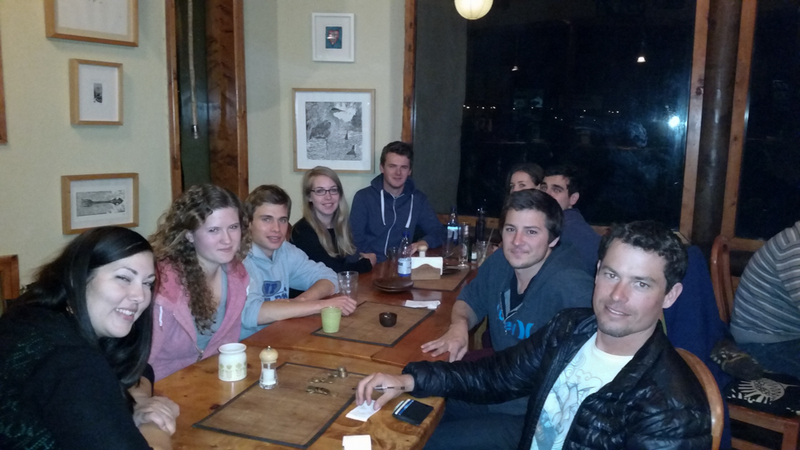 The rest were a mix of Germans, English, and Americans who were from a Spanish language school in Santiago and were visiting Pichilemu for the weekend. Average age was probably 23. 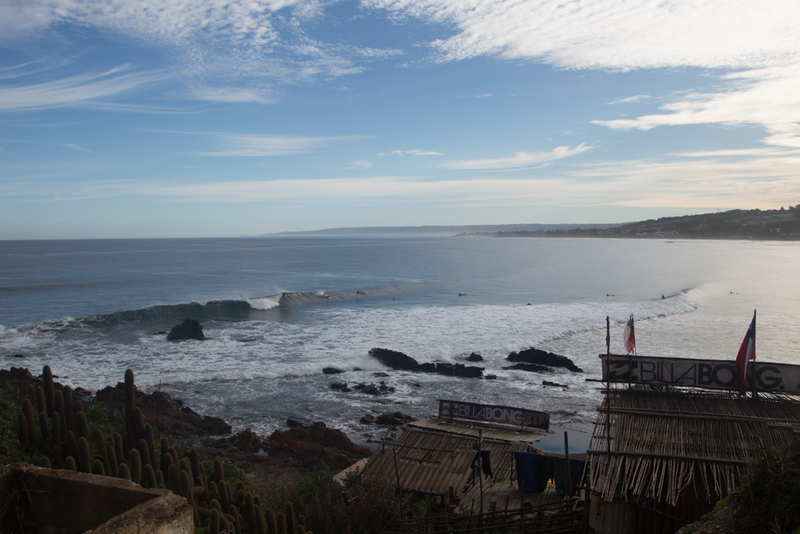 The next morning Nick and I checked Lobos early but it wasn’t looking too good so we decided to take the Trooper and explore an area to the north of Pichilemu near a small town called Navidad that was rumored to have a really good left point break. This is one of my most favorite things to do: searching for good waves. 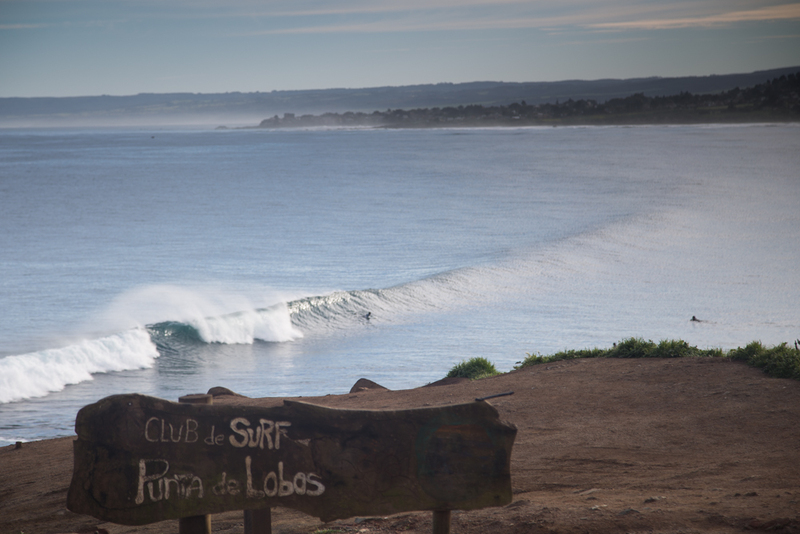 We wound up at a small beach pueblo called Matanzas and we felt like we were definitely on the right track to find the wave. Then when I employed my strategy of befriending the local surf shop owner. 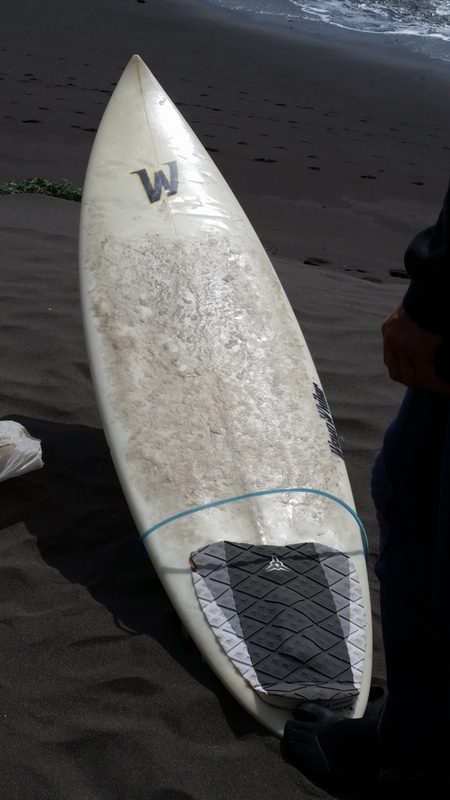 The owner was gregarious surfer dude and he invited us to come surf it with him later when the tide was lower. Nick and I found this surprisingly amazing; most surfers are super protective of the “secret” spots but this particular local gingerly invited us along with him. It is risky business to invite traveling foreigners to experience your local good waves because in these days of the Internet and easy communication a secret spot could easily be exposed and overrun with surfers. Obviously though, Nick and I were stoked on the invitation and went along and we were treated to the best waves of my trip at this fast and hollow left point. I caught a handful of good ones and found two barrels, but not all was good. First the current at the spot was ripping and so constant paddling was required to clamor back up the point after catching a wave. But worse for me was that about 2 hours into surfing, on one wave I successfully got a first barrel and then was greedy and went for a second barrel but ended up wearing the lip of the tubing wave on my shoulders. This compressed me into my board and minorly re-injured my right ankle which I had sprained a month before. I had to stop surfing and realized I would need to take it easier; my fragile ankle was not yet healed enough to surf intense waves requiring late drops or or intense curls. I swam slowly to shore and after about 20 minutes I felt strong enough for the 45-minute walk back to the town where our car was parked. 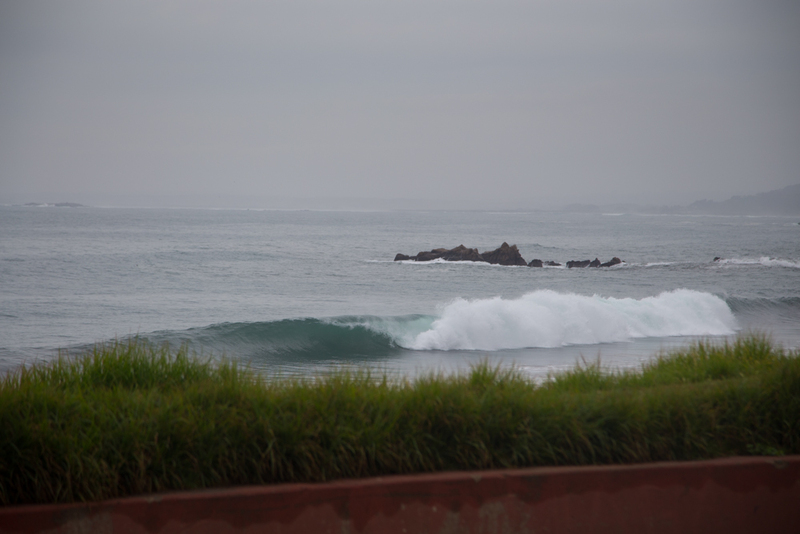 Along the way I began thinking that it might be prudent to end the surfing portion of my Chile road trip. I felt good after the day’s discovery and my surf session despite the ankle injury I was stoked. Plus, I figured the silver lining was that instead of surfing I could go snowboarding, which is much safer for my ankle because my boots provide firm support. It felt great to be in Chile! The left point at Matanzas showed some potential. 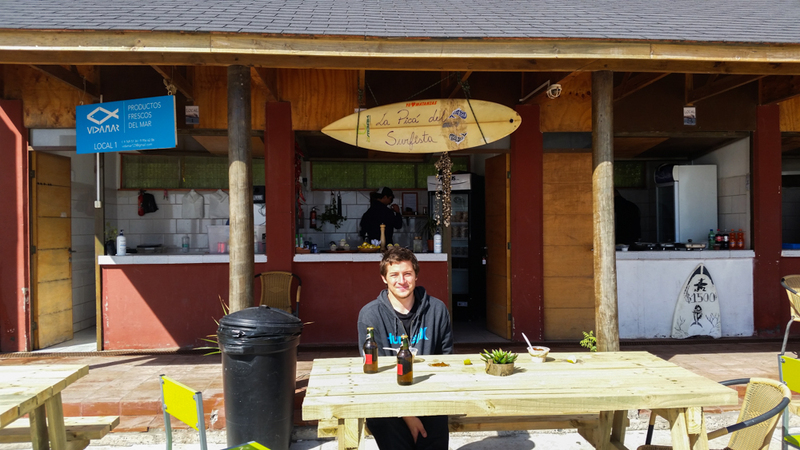 Nick knows the perfect fuel to power a long session is ceviche from the shack on the beach! That evening there was an amazing sunset. Back at the hostel I enjoyed an amazing dinner cooked by a Chilean/Italian guy named Dino who was friends with Juani, the hostel owner. 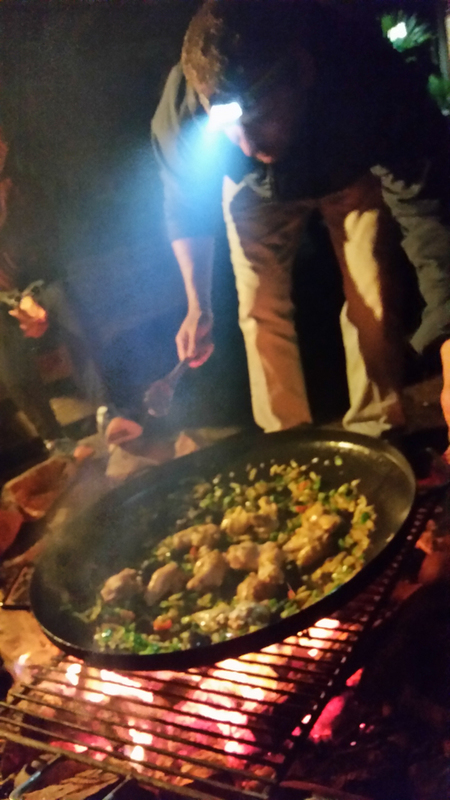 Dino cooked a seafood risotto using a large disco over an open campfire flame. Besides Matti’s chiken mole this was the best meal I’d had in Chile thus far. In fact, upon reflection I realize that all the best meals I had in Chile were home cooked. 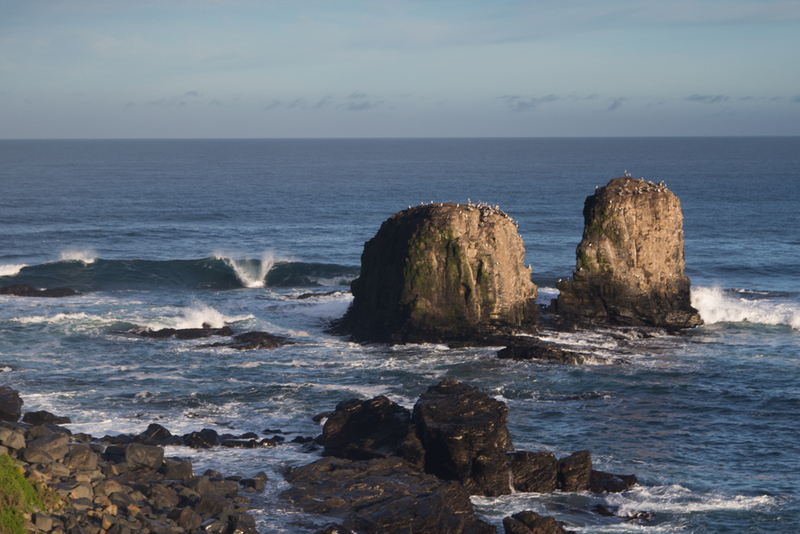 The next day was Sunday and I took it easy and took some photos of the inside part of Punta Lobos in the morning. 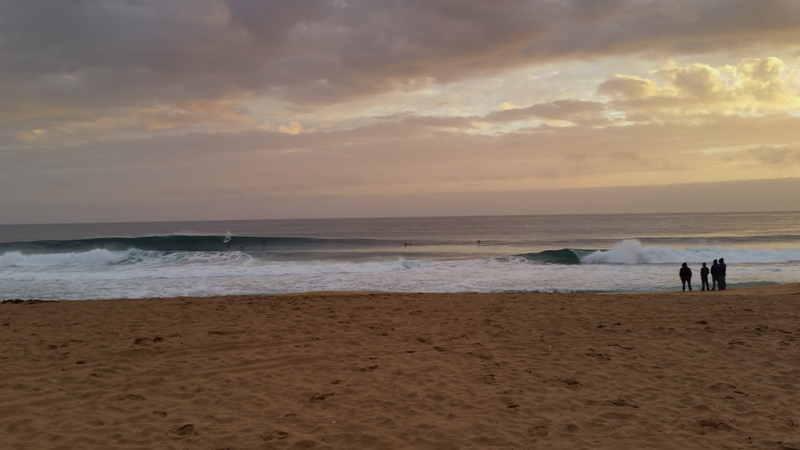 The swell had dropped and there was nothing happening outside the rocks, but the morning saw clean conditions and a relatively light crowd. I should’ve paddled out then, but instead I went for a surf in the afternoon. 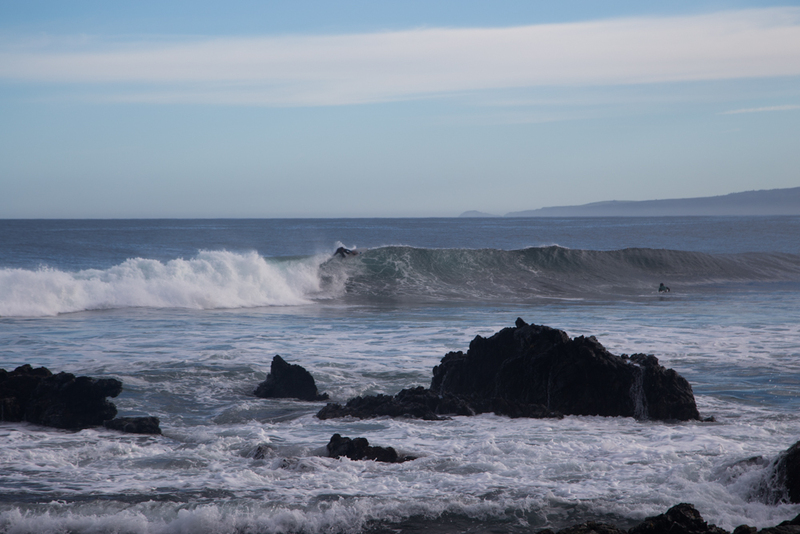 Punta Lobos gets crowded on the weekend as all the Santiago people head west to the beaches for some surfing. Most of them don’t get up early, which I think is why the morning is less crowded. During my afternoon session my ankle was still feeling weak and I found it difficult to get in the right position to avoid a late takeoff given the crowds, but I caught a few waves nonethless and enjoyed the pleasant day and being in the water. 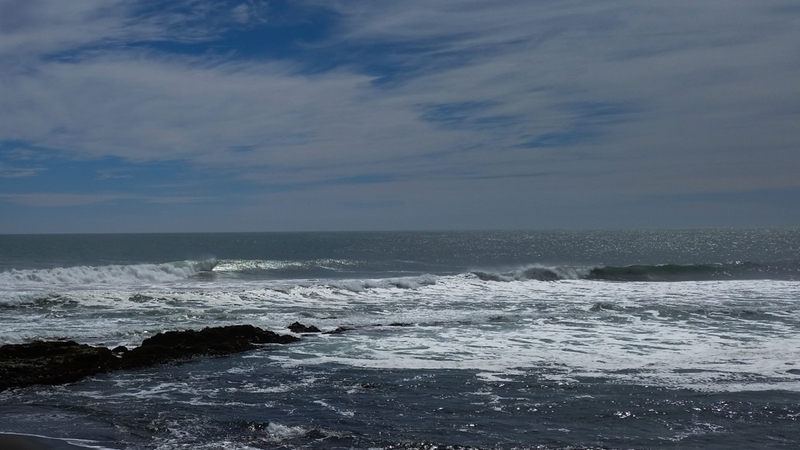 Ripping the inside wave at Punta Lobos. 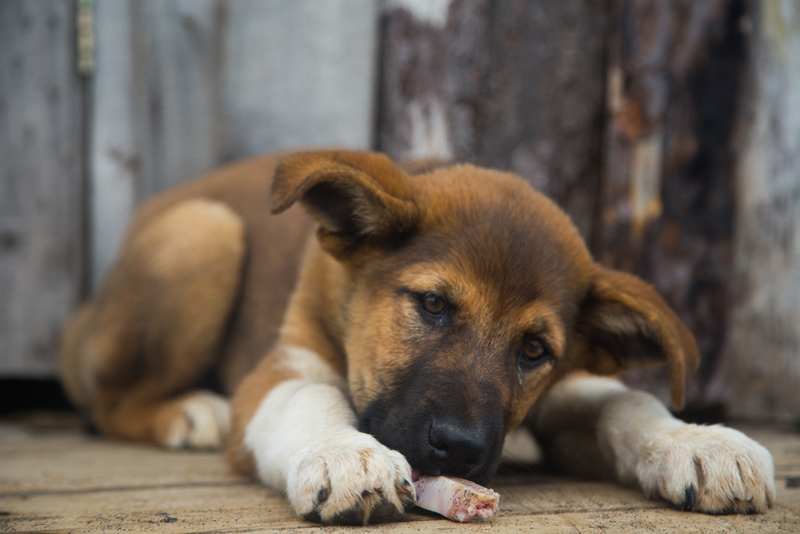 Dog chewing on a bone at the shack I was taking photos at. 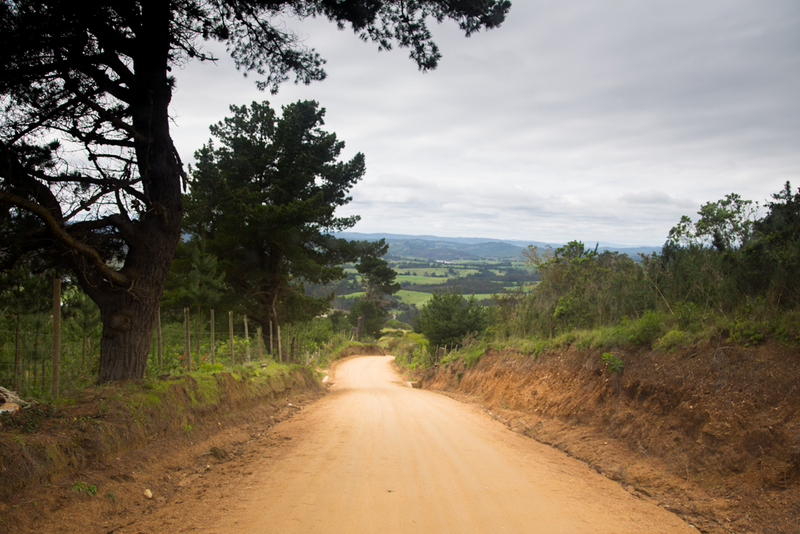 Fortunately I made it to the main highway, Chile’s Ruta 5, before disaster struck. The first thing I noticed was the temp gauge had crept up from about ⅓ to just over ½ between the “C” and the “H”. I was concerned, stopped to check the oil and add water to the overfill tank, and then I kept going. Shortly later I started feeling the engine lose power and the temperature hadn’t back down to normal, so I decided I stop and call the owner. I stopped near an exit and the engine wouldn’t start again. Crud, most definitely NOT GOOD. I called the owner and he told me to stay put, that he’d send a mechanic, but I knew that wasn’t going to happen as I was solidly 5 or 6 hours away from Santiago. 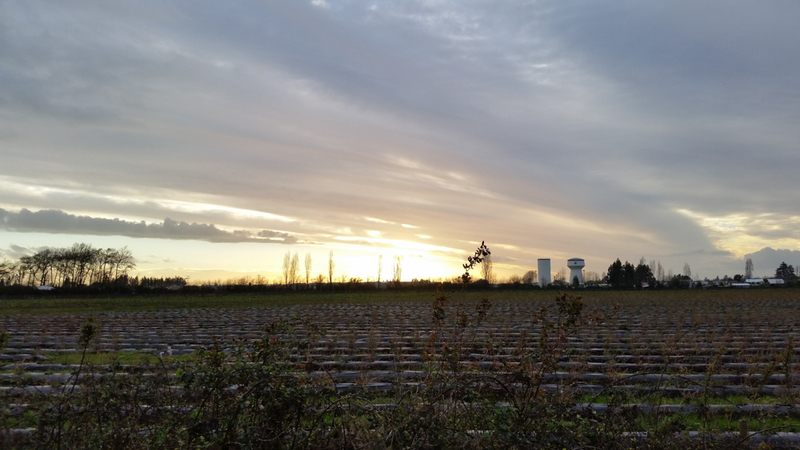 With the sun going down, grabbed all my stuff from the car and began walking down the highway, off the first exit and into a town called Parral. The strange looks I got as people saw this gringo with 2 backpacks and a snowboard bag with a surfboard strapped to the top were pretty classic. 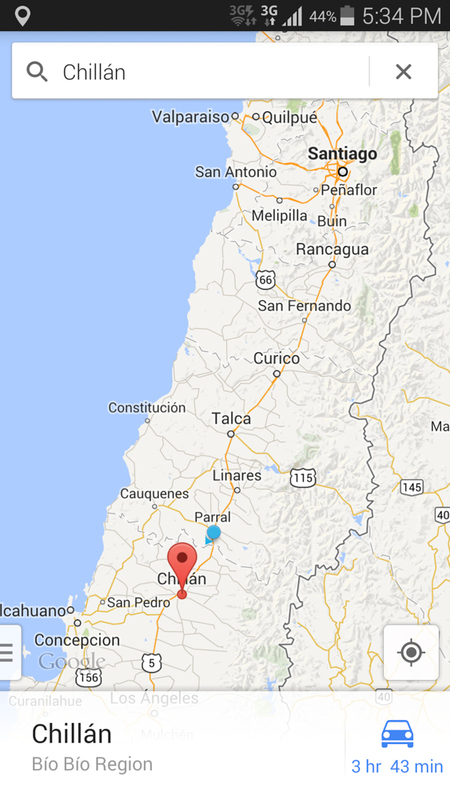 I asked around for directions to the bus terminal, where I knew I could find taxis and hopefully a hotel, or worst case just take a bus to Chillan, which was only about 90km to the south and would certainly have everything. A taxi driver pointed me to Residencia La Igualdad, which is run by a nice family. It was like a 2nd and unplanned homestay. I was heading towards Chillan when I broke down. I’m the blue dot. After breaking down, this is the view from the car out the window looking toward the town of Parral. The sun was setting and it was shortly after taking this photo that I decided to carry all my stuff into the town and abandone the Trooper. I was lucky it was a big town! Over the next 48 hours I dealt with the bad situation I’d been dealt and what made the experience so pleasant was the family I was staying with, especially the owner Rene. I had to speak entirely in Spanish, nobody here spoke English, and I explained to Rene what happened. Upon hearing the car was still on the highway, he grabbed his truck and was able to tow it back to his house where I was staying. He also went to work fixing the engine and discovered the car had no water in the radiator. WOW that was clearly my problem; I had been adding water to the water tank but I should’ve been adding it directly to the radiator. The battery was also dead (2nd time this happened; previously I’d found someone to jump me), so Rene got an extra battery and we were able to get the car started. The root of the problem was revealed when we say the water we’d just added to the radiator leaking profusely out of the motor; clearly there was a coolant leak that caused the engine to overheat. 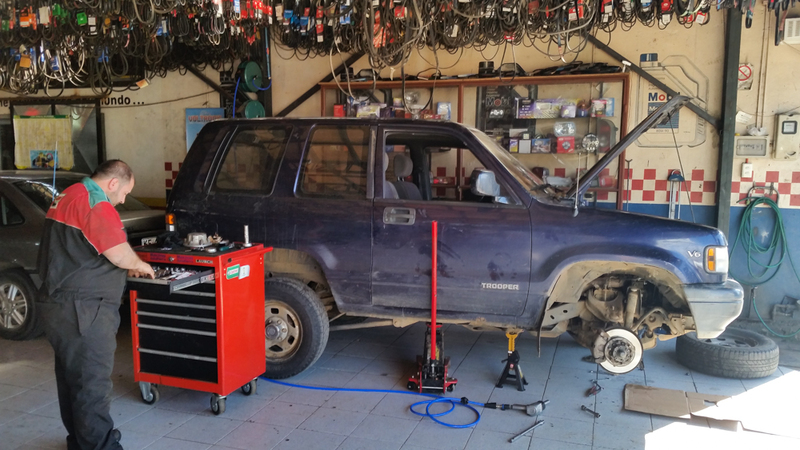 I conveyed all of this information to the owner and had confidence that we’d get the motor fixed in Parral and perhaps I’d even be on my way the next day. I spent all day Tuesday hanging out with Rene and working to get the motor fixed. That morning we drove the car a mechanic the knew both Rene and the owner. 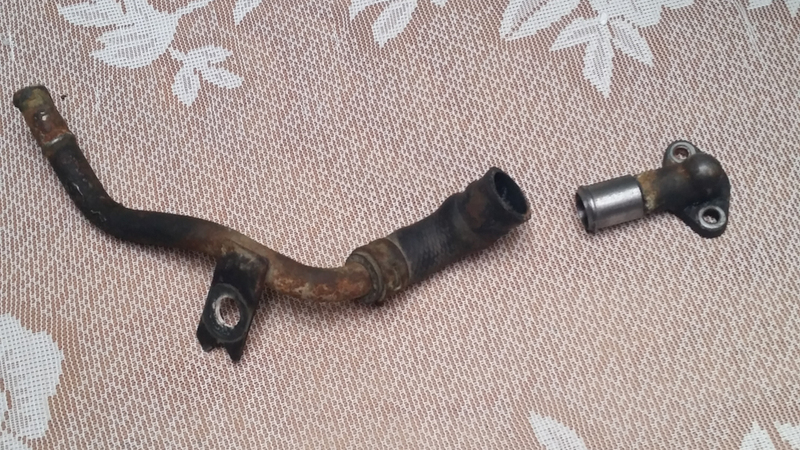 Within an hour he found the root of the problem: a pipe from the water pump which had already been patched once had broke again causing the coolant leak. 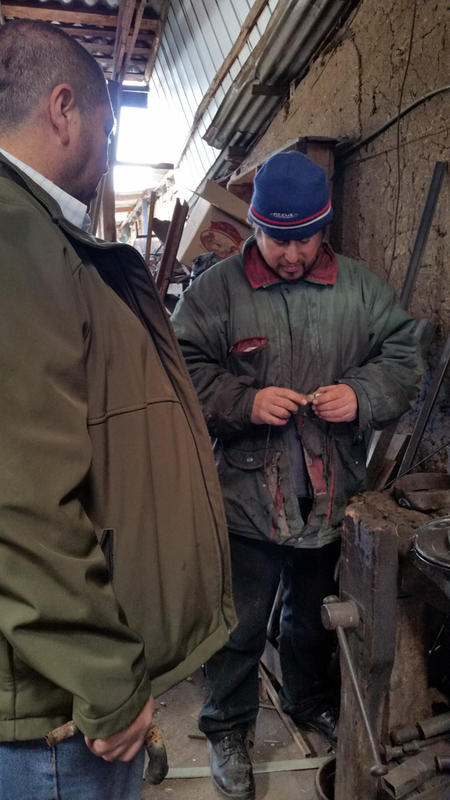 So Rene and I drove around town until we found a welder who could fix the problem. By 4pm the mechanic had the car fixed, but there was still a problem: lots of white smoke never stopped pouring from the tailpipe indicated a head gasket leak was likely allowing coolant to enter the cylinders. The mechanic did a pressure test and confirmed this was the case; this engine was murio: dead. Really not good. The original problem being that the water pump pipe broke clearly wasn’t my fault, but I did feel just a little responsible for driving the car that extra few kilometers when there was a heat problem. I called the owner and we talked. He seemed understanding and said that he’d drive down tomorrow AM and we could tow the car back to Vina del Mar together, as he’d need me to steer the dead Trooper. I agreed, but told him I wanted my rental deposit of 100,000 pesos (~$180) back before I’d go on the journey with him. He agreed. I stayed another night at the Rene’s house and had a nice meal with the family, where I watched Chile defeat Haiti in a soccer match. 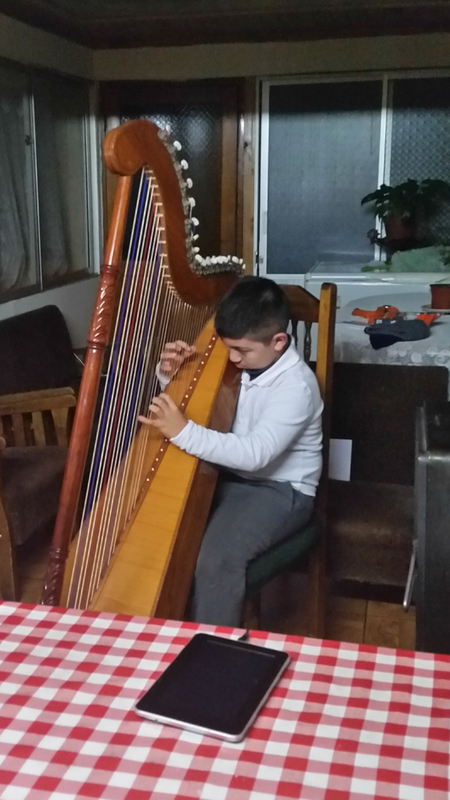 Also I listened to Rene’s young son play the harpsichord, one of the most unique instruments I’ve seen played before me. At the auto shop. This is the mechanic who figured out a faulty water pipe was the cause. This is the broken pipe after being fixed. The guy cleverly used dry ice to cool down the aluminum peace and fit the steel piece into it. Welding was not possible since the pipe was made from aluminum. You can see the rubber hose that was the original repair that broke. 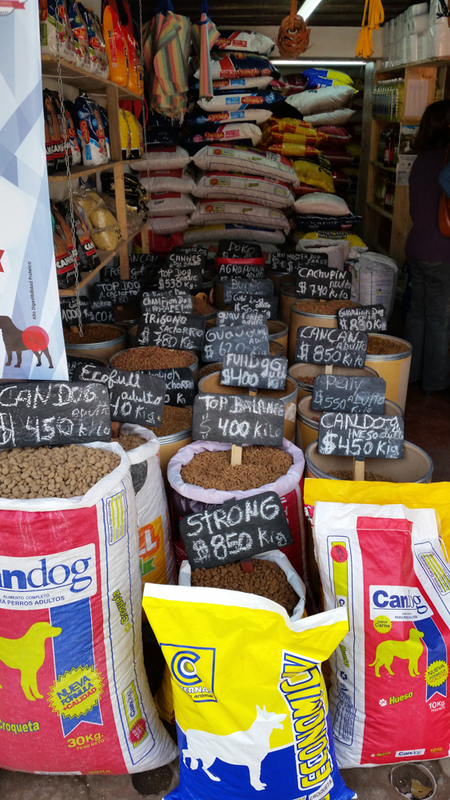 In Parral you could buy a bunch of different types of dog food. The next morning I woke up to an e-mail from the owner stating that he changed his mind and he actually wanted me to pay him $1000 for a tow truck to take the dead Tropper back to Vina, plus another $1000 for the engine repair. Welp, no doubt I wasn’t going to do that: besides being lied to by the owner the previous day, I really didn’t feel completely responsible for what happened. Plus I didn’t like the way he changed his mind so suddenly and was demanding money after I had spent so much effort making sure the car was taken car of. So I decided to just leave back to Santiago on a bus and ignore his requests for money. The broken Trooper was the owner’s problem, afterall, and Rene and myself even spoke with a police officer who confirmed the same. I had no responsibility to bring it back so Rene and I took it to a safe place, the gas station near the higway. This was a bummer for the Trooper, but I really didn’t want to deal with the unreasonable owner it made sense to leave. My goodbye to Rene and his family was heartfelt and I can reflect with sincere gratitude how nice they were to me and how much they helped me navigate this thorny situation. I will always be thankful to them. In Chile stray dogs are not quiet as stray as they look. 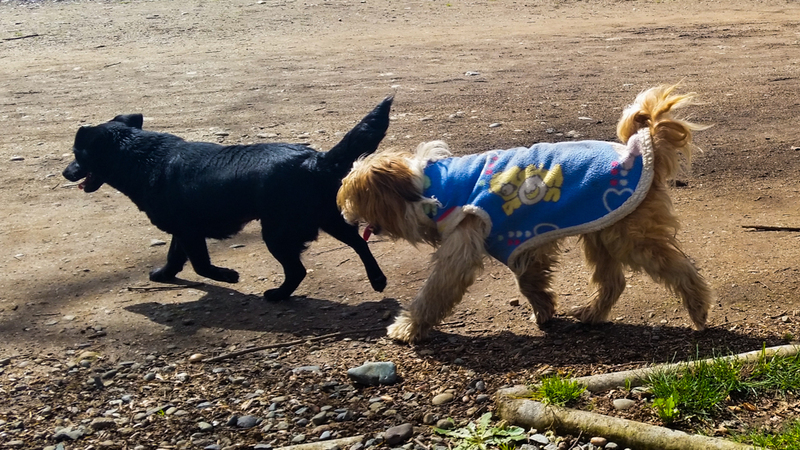 Chileans like to put sweaters on dogs to keep them warm through winter and generally people make sure no dogs suffer unnecessarily. 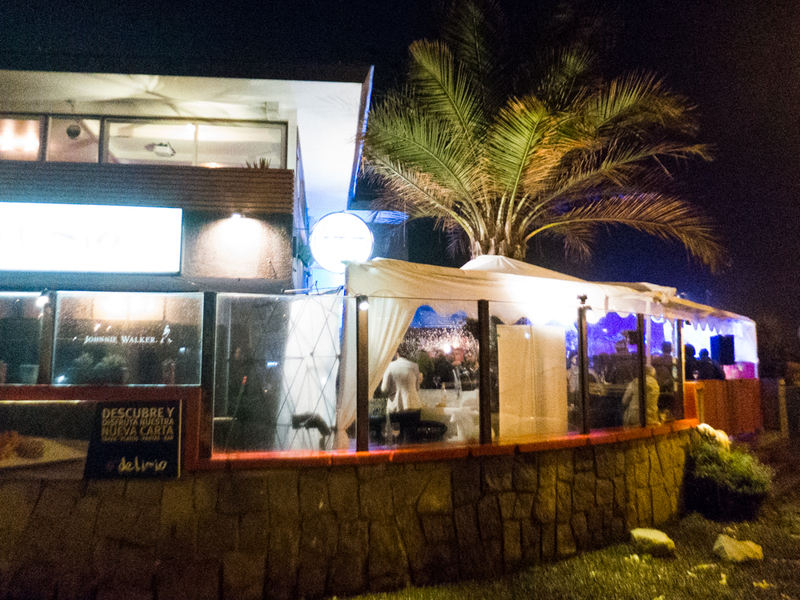 Back in Santiago I stayed at a hostel owned by the same guy, Juani, who owned the surf hostel at Punta Lobos. 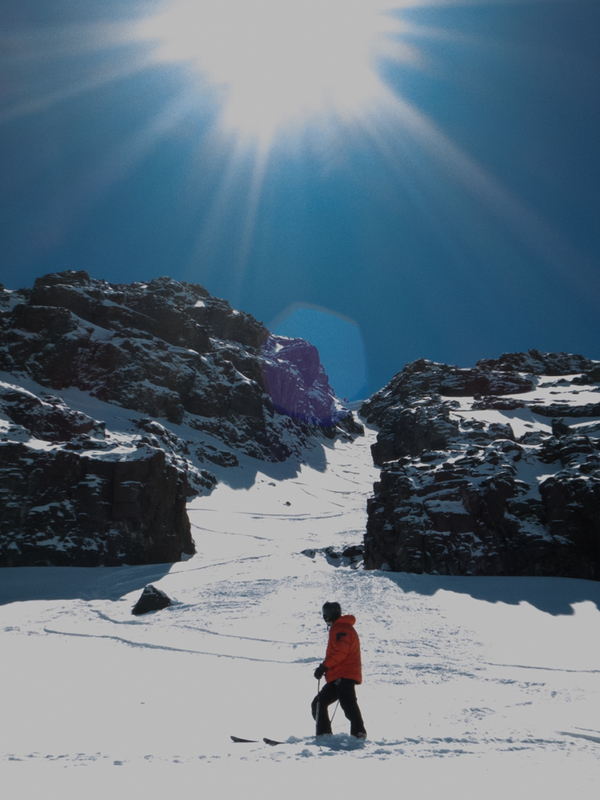 He told me that there was a shuttle organized a couple times a week which would take people from the hostel early in the morning to Valle Nevado, which is in the Farallones mountain range, which is the range that is only about 1.5 hours from Santiago. So I signed up and on Thursday was up in the mountains getting run after run at the uncrowded resort. The snow was not very good, nothing fresh, and very icy in the morning but softened up by the early afternoon. I found some awesome, long groomer runs. 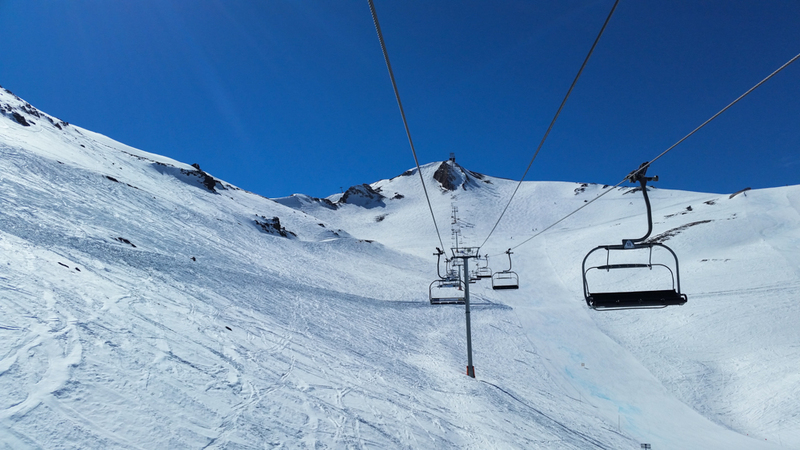 Just after midday I skinned over to El Colorado resort and to the peak for a good view and a fun run back to Valle Nevado. All in all it was a good day. 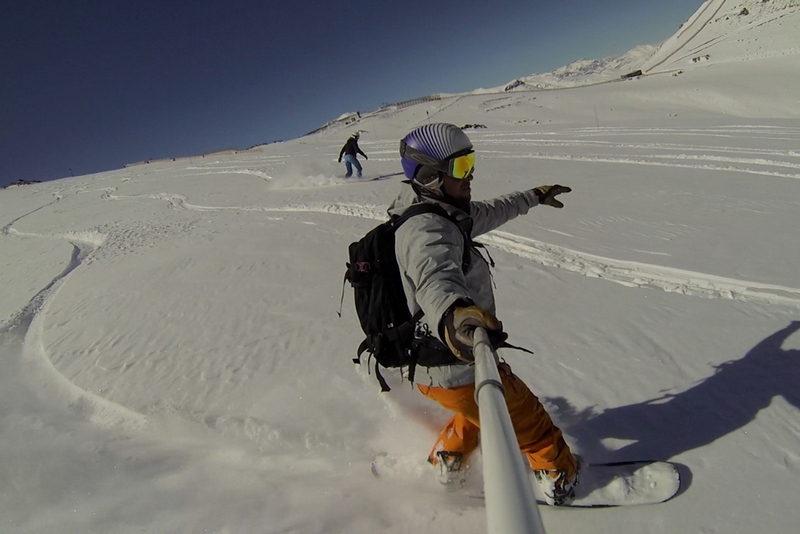 The Valle Express chair leading me to the top of Valle Nevado. 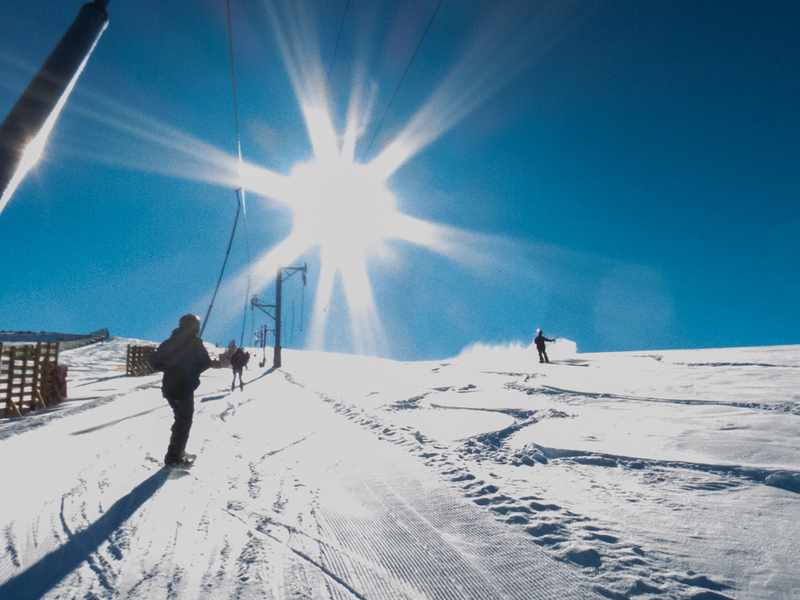 Coverage and conditions weren’t great, but improved as the snow baked in the sun and softened. 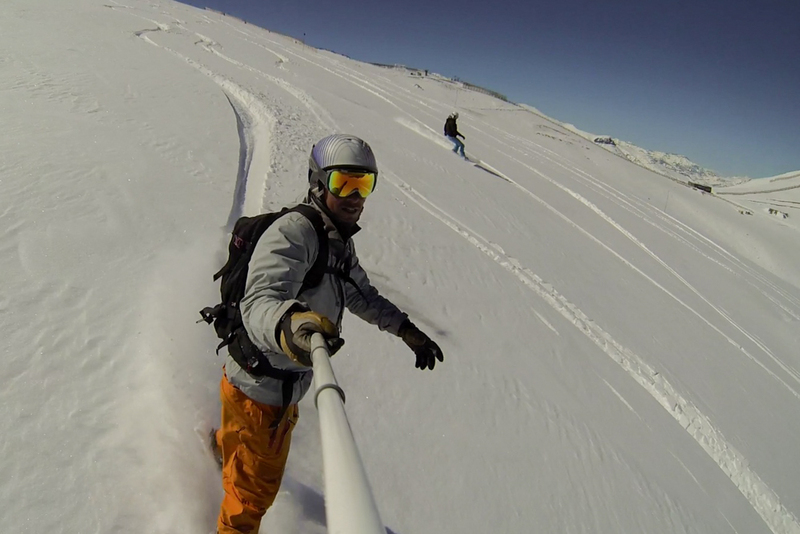 Selfie at the top of El Colorado after skinning up. On Friday I went back to Renaca to hang out and say goodbye to Matti, Berner and Matias. It was a relaxing day and I had dinner with Matti at Delirio. That Saturday morning we were lazy, had a nice breakfast and we said our goodbyes. I headed back to Santiago and checked back into the hotel. My flight was on Monday morning so my plan was to take advantage of what was likely the last powder day of the season the next day snowboarding with Sebastian. He picked me up at the subway station and we went to his house in Santiago and then we drove up to Magdalena’s parent’s cabin at La Parva. It was ski in / ski out! 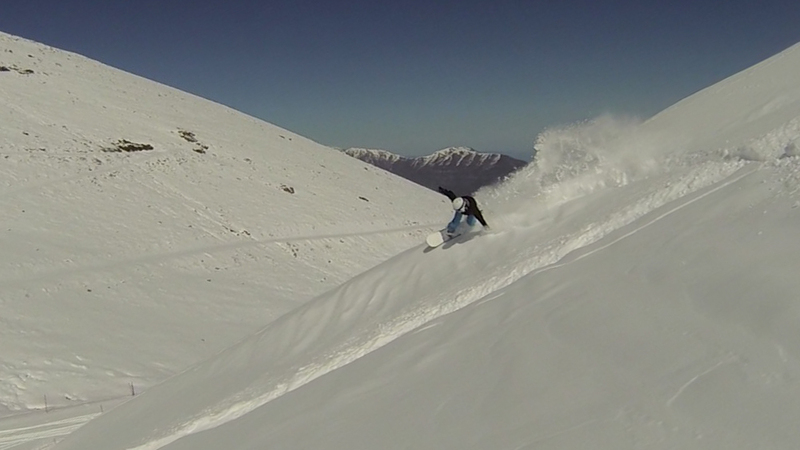 Sunday was an awesome powder day in the Farallones and at La Parva. Sebastian’s kids were being watched by Maria, the nanny, and so the 3 of hit us it hard all morning and into the early afternoon. Magdalena and Sebastian knew La Parva like the back of their hands and led me immediately to a long powder run on the south facing part of the mountain. We lapped the route 3 times and carved out many fresh tracks. 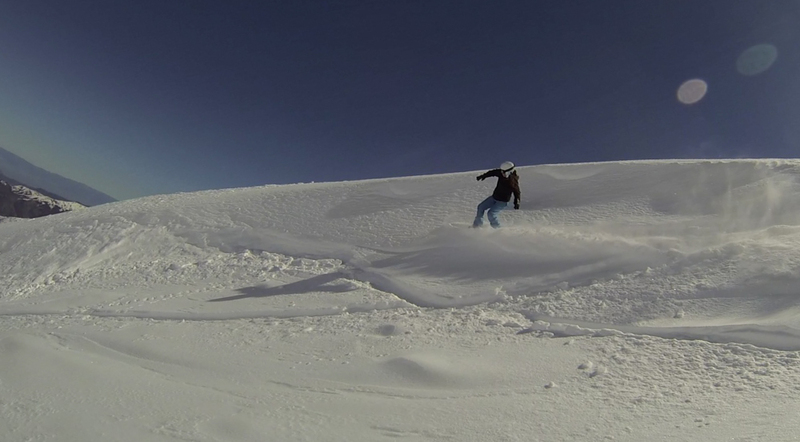 For one run I took out my GoPro and captured a few sweet surf-inspired carves Magdalena laid down on the snow banks. Such great style! Also I saw a few people in the backcountry and some amazing places to ski just off-piste, most notably The Chimney – a long couloir that is the most prominent feature on the north side of the resort. The snow warmed up by 2:30ish and I was tired so headed back, but first having one beer in the sun with a few of the mountain and Santiago in the background. A very nice day! Andres and Beltran watching their parents get ready to shred the mountain. 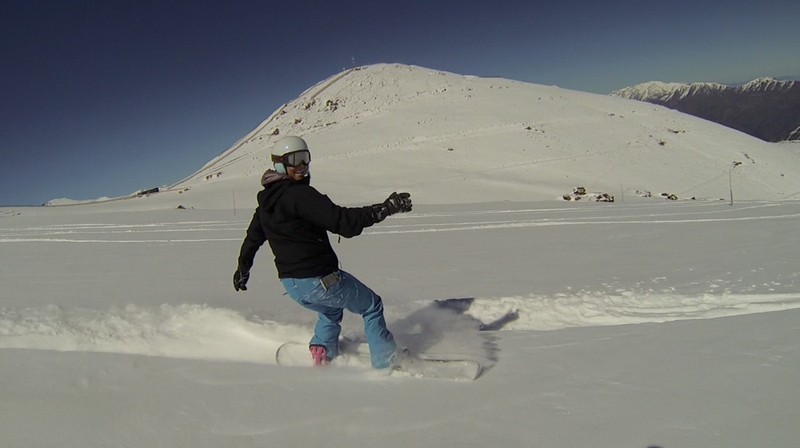 A fantastic day of snowboarding fresh snow ended my trip in Chile. That evening was my last in Chile and I left my hostel early on Monday morning and commenced a 24-hour journey back to San Francisco. The month and a half I spent in South America confirmed what I thought I knew already: this is a place that I could live; a kind of California in reverse. While here I formed so many fond memories, learned, meet new family members and made new friends. All of this will serves to build a strong desire to return and explore more! Below are some more pictures from the mountain. 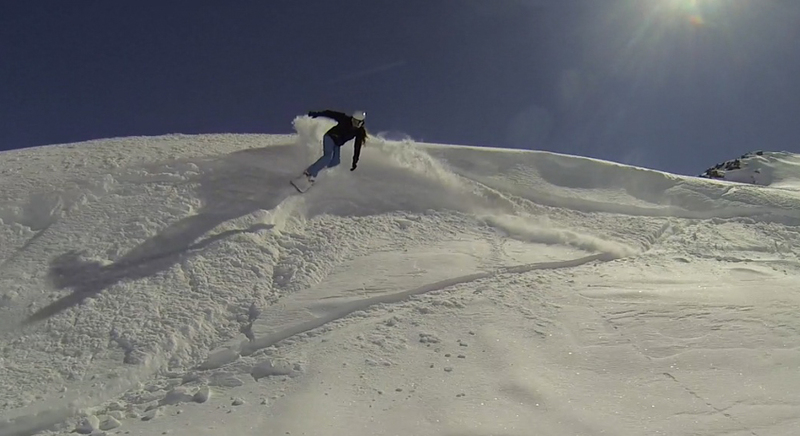 It was really great to see Magdalena lay down some sweet surf inspired carves! Magdalena’s boss Scott at the end of the Chimney couloir. Next time I return I definitely want to descend this couloir!